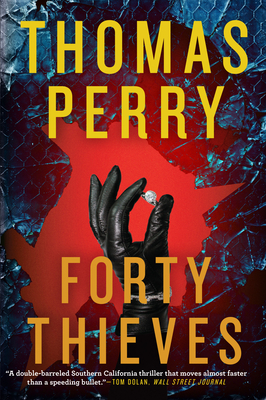 From New York Times bestselling author Thomas Perry comes a whip-smart and lethally paced standalone novel, Forty Thieves. Sid and Ronnie Abel are a husband-and-wife detective team, both ex-LAPD. Ed and Nicole Hoyt are assassins-for-hire living in the San Fernando Valley. Except for deadly aim with a handgun, the two couples have little in common--until both are hired to do damage control on the same murder case. The previous spring, a body was recovered from a storm sewer after two days of torrential rain. The corpse was identified as James Ballantine, a middle-aged African American who worked as a research scientist and was killed by two bullets to the back of the head. With the murder case turning cold, Ballantine's former employers bring in the Abels to succeed where the police have failed, while the Hoyts' mysterious contractors want to make sure that the facts about Ballantine's death stay hidden. Dramatic car chases, illicit affairs, and a notorious ring of Eastern European diamond thieves all play into the plot as the book races toward its high-octane climax, and the Abels circle ever closer to the dangerous truth. Thomas Perry is the bestselling author of over twenty novels, including the critically acclaimed Jane Whitefield series and The Butcher's Boy, which won the Edgar Award. He lives in Southern California.